VISTA HP - APCO's high end, hybrid reflex technology paramotor wing - purpose built and tuned for pilots who seek uncompromised safety, peak performance and fine handling. From Prima IV to our tandems - Play 42 and Fun 42 - VISTA HP completes APCO's already extensive paramotor range, offering the ultimate choice for the most discriminating paramotor pilot. Available in 2 sizes - VISTA HP S and M - covering weight range from 70kg.-165kg. EN Certification flight tests confirm the outstanding safety of the wings. VISTA HP is a direct result of pilot feedback and the demand for higher performing, quicker handling, wide speed range wing, which could stand up successfully to latest generation of reflex wings. Featuring competitive speed range and performance, combined with the classic virtues of APCO's paramotoring range - this is what makes the VISTA HP a true winner. Perfect launch and flare, even lighter brake pressure and more responsive, direct handling than you are used to from APCO wings, delightful and reassuring. 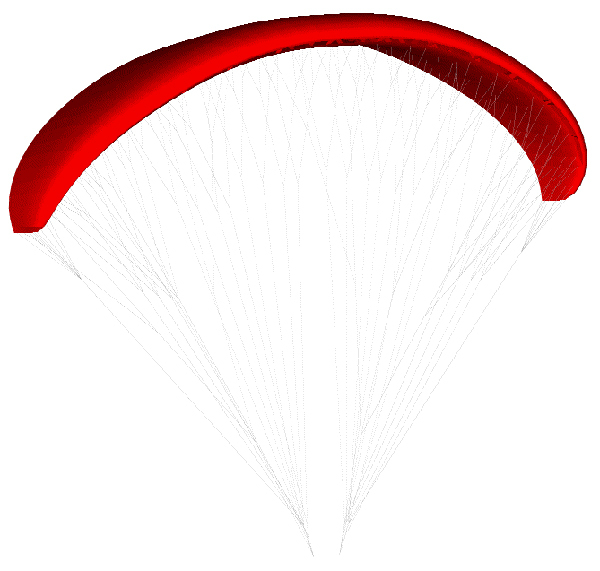 To sum up, the design brief for VISTA HP was to combine the advantages of APCO paramotor wings with reflex type wings - ultimately to produce a wing which could outperform Thrust HP as well as rival reflex wings. VISTA HP 's design concept is based on evolution of Thrust HP. Using APCO's proven hybrid reflex profile technology on a high performance platform, is what VISTA HP is about. Converting VISTA HP profile into full reflex profile when accelerated, retaining the advantages of easy launch and flare at the lower end of the speed range is the key to its success. A number of Apco unique features incorporated into its design. Out of gas (expensive today) – VISTA HP is well suited to free flying too and can be supplied with paragliding risers on request. It is an excellent free style ACRO wing and very potent, fast cross country wing many of you will enjoy. Former standard speed bar / stirrup discontinued. The Vista HP comes in an ergonomic rucksack incl. an inner stuff bag, compression strap, riser sock, spares kit, owner's manual and an industry first 3 yr/250 hr warranty - all as standard.